Some can't believe that Brad would actually say such a thing. But he did in a recent interview with the CBC. Mr. Lamb was right that the market needed to cool off. Thing is, it never really did. 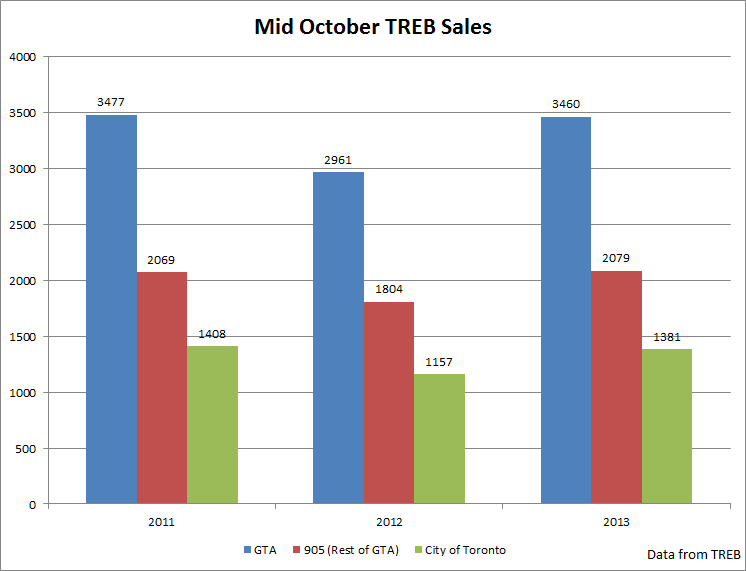 Today, TREB published mid-October stats and they were no good. Sales rebounded and prices went up! The Toronto real estate bubble keeps growing larger. 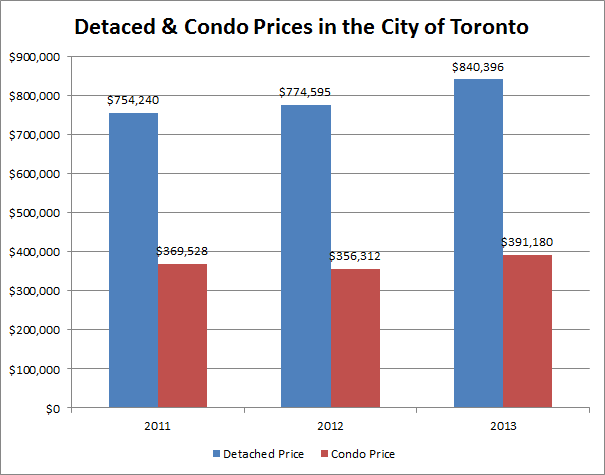 Prices in Toronto went up by 36% since 2009. The Canadian government tried to slow price inflation by tightening mortgage rules on several occasions without much luck. Sales declined briefly but prices kept on rising. Meanwhile Singapore is actively fighting its housing bubble where prices have risen 33% since 2009. For instance, Singapore's government introduced measures such as including a cap on debt at 60% of a borrower’s income, higher stamp duties on home purchases and an increase in real estate taxes. Should Flaherty tighten mortgage rules even further? What do you think? Let's get back to the mid-October housing market update. 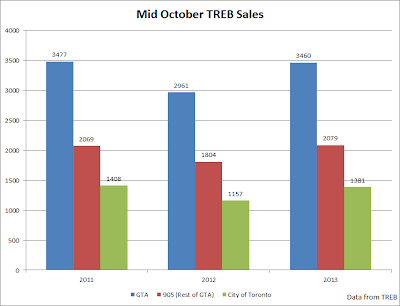 Overall sales in the Greater Toronto Area (GTA) were up by 17% during the first two weeks of October on a year over year basis. Sales were down 0.5% compared to 2011. Condo sales in the City of Toronto were up by 19.2% compared to a year earlier. Sales were down 4.4% compared to the first two weeks of October in 2011. 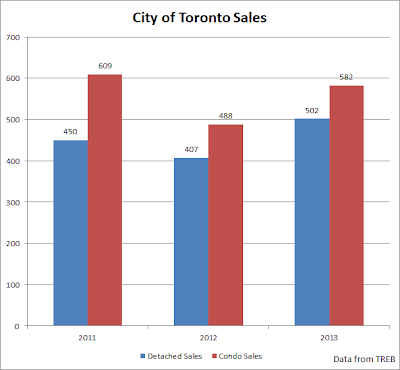 Detached homes sales rose 23.3% compared to a year earlier. The average home price in the City of Toronto went up by almost 10%. 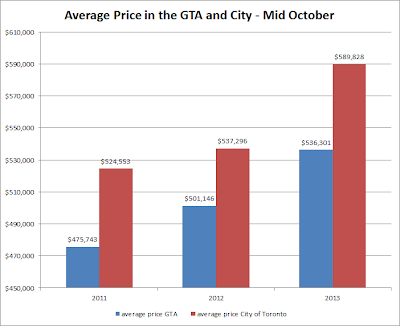 The average price was up 7% in the GTA in mid-October. Condo prices in the City of Toronto were up by 9.8% while detached home prices shot up by 8.5% compared to a year earlier.